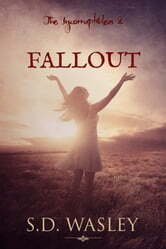 Fallout is book 2 in the young adult paranormal romance series, The Incorruptibles, by Amazon Bestselling author S.D. Wasley. The Spellbound Box Set: 8 Fantasy stories including Vampires, Werewolves, Steam Punk, Magic, Romance, Blood Feuds, Alphas, Medieval Queens, Celtic Myths, Time Travel, and More!